What’s the rags to riches story that has led a young girl in poverty to become the World’s wealthiest self-made female billionaire? She got a factory job making watch faces for $1 a day, and sent the money back to her father. Bored with the job, after three months she quit, but was given a promotion instead. Guessing why, she said “Maybe it was because my resignation letter was well written and this attracted the attention of the factory supervisor”. She kept being promoted up to management but then in 1993, at 22 years old, her factory shut down. So she decided to take her knowledge, connections and $3,000 in savings and begin her own watch face factory, which she started next doors to her old factory. The early days weren’t easy: ”Twice I even had to sell my house in order to pay my employees salary. Much like climbing a mountain, it's not your physical strength that will get you to the top, but your tenacity and persistence." Then, in 1997 the Asian financial crisis hit. This is when her persistence really paid off. She went to the watchmakers who owed her money and settled their debts in exchange for their equipment. So while other factories closed down, she gradually assembled an entire production suite for glass processing for next to nothing. Her success with Motorola led to HTC, Nokia and Samsung also calling. Then, in 2007, Apple launched the iPhone, and picked Qunfei’s company as the supplier. Ten years late, Lens Technology has 32 factories in seven different locations and employs more than 90,000 staff. Their glass is used in over 50% of all smartphones in the world, and in all Apple iWatches. 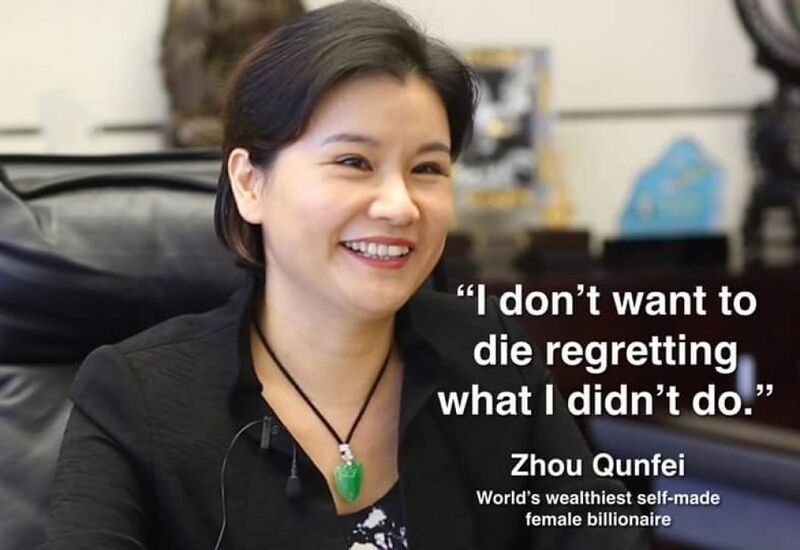 A year ago, Quinfei listed her company on the stock market, making her the wealthiest self-made female billionaire in the world. Today she is worth $6.4 billion. Qunfei says when she was a child she would watch the rain falling on lotus leaves. That’s what later inspired her to create Lens Technology's patented, scratch-resistant coating on smartphones. 'Droplets of water would roll around the surface of a lotus leaf and not leave any trace,' she said. How can you see every closed door as a new opportunity? How open are you to new opportunities that could transform your own success? How can you use your past experiences to support your future vision? Use Qunfei’s story as an inspiration for your own journey. As a self-taught expert in glass, she’s a living example of how, with persistence, every glass ceiling can be broken.